Titanium Pointed Back-Up Knife " Black handle & Sheath"
Compact Titanium Line Cutter w/Sheath "Includes 3 feet of 1/8" Bungee"
Titanium Blunt Tip Knife "Dual Mounting Options!" 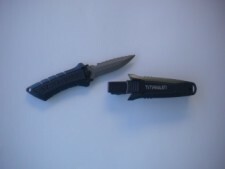 Titanium Spearfishing Pointed Knife "Dual Mounting Options!" Titanium Pointed Knife w/ Line Cutter "Dual Mounting Options!"